Udupi, 12 Feb: Theater is ever creative art. Sanskrit theater had grown significantly by ideology and experiment. Indian theater manifested diverse plays and experiments on human body. Its rich in all forms of art, said renowned theater critic J P Prabhakar Tumari. 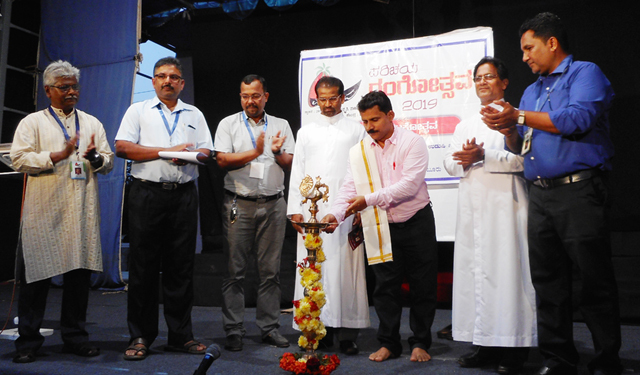 Prabhakar was speaking after inaugurating Parichaya Rangotsava-2019, 7-day theater fest that was organized by Parichaya Pamboor which is promoting Indian art, culture and literature, held at Pamboor parish ground, near Bantakal, here, on Sunday, February 10. Despite Indian theater faced influences from western literature and movies; it has grown because of its ideology and experiments. There have been changes in plays heeding to various pressures. Its irony that we are losing our originality owing to the influence of visual media and reality shows, said Tumari. He lauded the yeomen service of Parichaya Pamboor, in promoting diverse Indian culture. Speaking on the occasion, Pamboor parish priest Fr Paul Rego said that the plays that are staged by Parichaya are indeed brainstorming. The audiences get a chance to witness plays in Kannada, Tulu, Konkani, Sanskrit and Malayalam that will presented by Parichaya during 7-day fest. Parichaya Pamboor president Anil D’Sa presided the progrmame. The honorary president Professor Vincent Alva, treasurer Peter was present at the dais. The secretary Prakash Norohha compered the programme. The artistes of Ananya Bengaluru – theater group presented Kannada play, Atita, by playwright and director S N Seturaman.